Some 5000 people took part in this youth forum “Faith and Deeds.” A whole section was devoted to the ROCOR group, where we discussed the question “Is it easy to preserve Orthodoxy in the West?” and about 1,000 people took part in this. I gave the keynote remarks and talked about our mission and our participants. 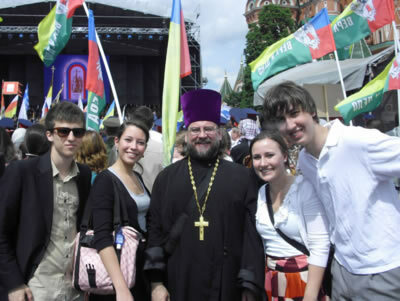 Our young people also spoke and described the life of Orthodox youth in the United States. What was of greatest interest to the Russians was our missionary work. Currently in Russia this work is being actively developed, especially among young people. To what conclusion have you come? Is it easy to preserve Orthodoxy in the West? The simply answer is “yes.” But the complex answer is both “yes” and “no” (he chuckles). Our missionary activity in the Diaspora has actually been a mechanism for self-preservation. We have striven to preserve our culture and faith and to hand them down to succeeding generations. This was internal missionary activity. Our external missionary activity, however, arose unintentionally. In small cities throughout the Diaspora, ordinary local people suddenly saw unusual buildings with domes; they became interested and would come in to find out more. In this way, first there was education and then came conversions. The Russians found this quite fascinating. In addition to the forum “Faith and Deeds” we took part in the work of round tables with Orthodox youth organizations, such as the “Sretenye”* group and the “Marontsy”** . We also visited an Orthodox club and the Martha and Mary House, where we saw small children doing handicrafts; they were making small pictures, small spoons and similar things for sale to help the monastery. This led us to draw the conclusion that we too ought do something similar to raise money for the benefit of the church. We also were able to meet with a club, where our young people could observe work being done with deaf and hearing-impaired Orthodox young people. In the club there also classes and workshops, which are conducted solely using sign language. We attended divine services in the church of Saint Nicholas in Kuznetsy, the Saint Tikhon Theological Academy. And, for the feast of the Holy Trinity, by special invitation, we attended a patriarchal Divine Liturgy at the Holy Trinity and Saint Sergius Lavra. Two of our young people, Andrey Muravyev and Adrian Fekula, during the chanting of the pre-Communion verses, went into the altar to receive the Patriarch’s blessing and they presented him with an album with photographs from our previous trip to Saint Petersburg. During the time that remained the young people visited the Lavra and venerated the relics. The relics of Saint Sergius Radonezh were even opened up for our veneration. On the following day we attended a service at the Cathedral of Christ the Savior for Patriarch Kirill’s name day. At the service there were 200 priests, 30 hierarchs and two patriarchs: Patriarch Kirill and Ecumenical Patriarch Bartholemy. After the service there was a procession from the Cathedral of Christ the Savior to the church of Saint Basil the Blessed on Red Square. Over 30,000 people took part in the procession. The feast of Saints Cyril and Methodius is a state holiday in Russia and we were able to observe the huge scale of the celebrations for the day in memory of these saints. In the evening we ended up at a concert dedicated to Saints Cyril and Methodius given in the Kremlin Palace. Father Andrey, what is the most important thing about trips like this? The most important about these trips is making connections. Official events, of course, are good and very important, but without connections among the youth, this thing will not go any further. The young people plan to continue their contacts through Facebook and Kontakt.ru. With the signing of the act of the restoration of canonical union, there was an opening of the gates that had divided the Russian Orthodox Church for all these years. The upcoming generation from both sides should not experience this separation. Interestingly enough, our trip was widely covered by the Russian press. For Russians, it was interesting to see how much we had preserved the culture. They find it hard to grasp that this third generation of émigrés still speaks Russian. Also interesting were the questions they asked us: Do you have churches? Do you go to church on Sundays? They were very surprised when we told them that we go not only on Sundays, but on Saturdays. The realities of our life are unknown to them. The Russians were interested in our experience of surviving in a foreign country, our experience in working with youth and our methods. During the youth conferences that we have been holding since the 1950’s, we propose various activities to the young people. For example, during the Saint Herman’s conference in California, the young people studied liturgics. A priest brought prosphoras, sacred vessels and explained in detail to the young people how the Proskomedia is done – the Proskomedia practically took place before their eyes. Since most of the young people never enter the altar, they cannot see what takes place in the altar during the hour before the Divine Liturgy. Similar events, where explanations are given to the young in a way they can understand, are today taking place in Russia. And what do the young people from the Diaspora get from these trips? Being in Russia, contacts with Russian Orthodox youth; and, in the words of one of our young participants, it’s like “fresh air for an asthmatic.” As we visit holy places and venerate relics, which we have read about only in books, we receive special encouragement and are spiritually strengthened. In addition to this, relating to Orthodox young people who speak Russian – that is also very important when you live in the West. When our young people see how energetic and good-hearted young people are in Russia, this recharges our youth. They take this back with them to their parishes outside of Russia. There is a mutual benefit. They receive much from us, and we receive a lot from them. *Translator’s note: The name of the group is derived from the Russian name of the feast of the Meeting of the Lord («Сретение»), which is in fact the Slavonic word for “meeting.” The group began in October 2007 with the meeting of 5 people who wished to deepen their encounter with the Lord in their daily lives. **Translator’s note: The name of this group is derived from Saint Maron, a holy Syrian monk who lived in the fourth and fifth centuries.